Definition at line 48 of file wccp.cc. Definition at line 51 of file wccp.cc. Definition at line 52 of file wccp.cc. Definition at line 53 of file wccp.cc. 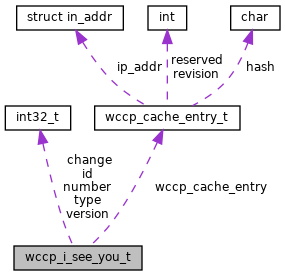 Referenced by wccpAssignBuckets(), and wccpLowestIP(). Definition at line 49 of file wccp.cc. Definition at line 50 of file wccp.cc. Definition at line 55 of file wccp.cc.